If variety is the spice of life, then there’s no better time to be a beer lover. With microbreweries springing up all over the country — including several right here in Sandpoint — beer fans have more options than ever in finding new and delicious brews. A happy BeerFest of the past. Photo courtesy Greater Sandpoint Chamber of Commerce. Problem is, all those options can be overwhelming, and it’s hard to find favorites without taking a chance on a whole pack. That’s why beer festivals are a great opportunity for lovers of the brewing craft. They let attendees experience a variety of beers in small servings at a low base cost. 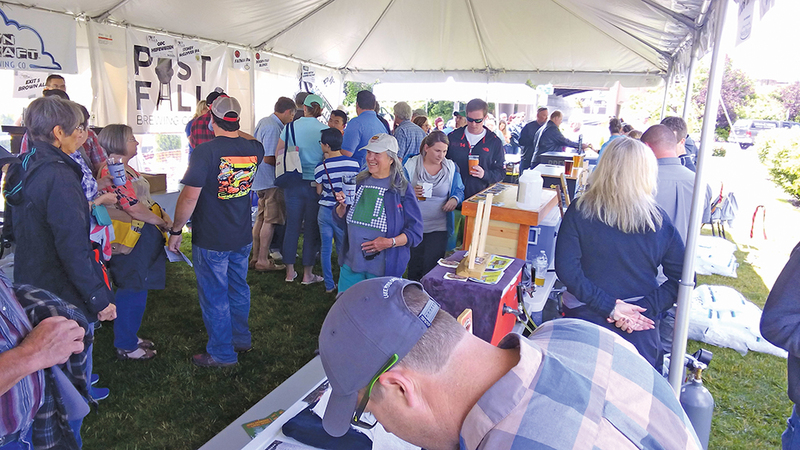 And it’s hard to imagine a better combination than top-notch beer and the beautiful vistas of City Beach, which is exactly what the Greater Sandpoint Chamber of Commerce’s BeerFest does. Last year’s Sandpoint BeerFest drew a crowd of almost 1,000, and with a great forecast set for this Saturday, it’s likely a similar crowd will turn out for the 2018 event. It doesn’t hurt that the list of participating breweries is as impressive as ever, including 12 String Brewing Co, Hunga Dunga Brewing Company, Laughing Dog Brewing, MickDuff’s Brewing Co., Waddell’s Brewpub and Grille, Rants and Raves, Payette Brewing Co.,Trickster Brewing, Post Falls Brewing Company, Wallace Brewing and more. In addition, hard cider from Summit Cider and Whiskey Barrel Cider and non-alcoholic drinks like MickDuff’s root beer will be available. The system is simple. General admission is $25 and can be purchased in advance online or at the event. That gets attendees a commemorative glass plus six tokens, each of which is good for one beer sample. Two samples are equivalent to a full glass of beer. Find a beer you love? Then go ahead and spring for a full glass. Otherwise, spread your tokens around for a full tour of Pacific and Inland Northwest breweries. Thirstier beer lovers may want to shell out for a VIP pass, which are $60 and exclusively available online until midnight Friday, July 13. The VIP pass includes a Sandpoint Beerfest glass, eight tokens, an exclusive Brew Crew BeerFest T-shirt, one meal, a basic pretzel necklace, a brewery tour at a local brewery, an easy-access VIP line and a 15-minute-early entry. Whichever option attendees choose, they’ll be treated to live music by Tennis, one of the most energetic and beloved Sandpoint party bands around. Food catered by Trinity at City Beach will also be available, providing some delicious grub to go along with that drink. Sandpoint BeerFest takes place Saturday, July 14, from 12-5 p.m. Children are allowed to attend under the guidance of their parent or guardian, but no dogs are allowed at City Beach. The event is sponsored by Sweet Lou’s, Hendricks Architecture and Ting Sandpoint. As the event is limited to a maximum 1,000 attendees, buy tickets early at https://tickets.beerfests.com/event/sandpoint-beerfest to ensure entry.